When Don Otvos first joined Datahug earlier this year, the sales team was spread out between San Francisco, New York and London. They were operating independently, isolated from each other. Most importantly, they couldn’t learn from each other and collaborate as quickly as they needed to. As Otvos himself puts it, “There’s simply no substitute for a bunch of people sitting in a room swapping product, market, and sales expertise.” When he came aboard, he got the chance to make this vision a reality by rebuilding the company’s sales engine from the foundation up. At the time, CEO Ray Smith’s mission was to create a sales process that would be repeatable and scalable, with built-in indicators showing whether the team was on the right track. He was on the hunt for an architect for this system when he was introduced to Otvos, then a seasoned sales ops leader at App Annie (already a Datahug customer). While Smith had salespeople who knew what they were doing on their own, he needed someone to give them common purpose and strategy. As a Datahug user, Otvos already liked the product when he visited the company’s office in the fall during Dreamforce 2014. By February, he was leading the sales team as VP of Inside Sales and Sales Operations. And since then, their metrics, goals and results have shifted dramatically. It’s rare to see one hire make such a landmark difference, but Otvos and his ops-focused philosophy — with Smith’s endorsement — have indeed transformed the company’s prospects. Here, he shares what he knows, the experiments he’s run, the low-hanging fruit available for almost every startup, and how to adopt a whole new streamlined approach to sales. The number one thing that set him up for success? The fact that he was already an experienced salesperson himself. Before App Annie, he had run sales ops for Yammer as it grew from a $400,000 annual run rate to an $80 million run rate in his three years on the job. Before joining Yammer in 2010, he was a regional account manager at MuleSoft, Director of Inside Sales at Nevis, and a rep at several companies of varying sizes and products before that. Building this type of team requires everyone being in the same place. As a leader at the company, you want to be able to walk around and talk to everyone in the team to get their input on how conversations are going and any adjustments you need to make. It also creates stronger bonds between sales colleagues. When you do need more senior members for the team, this gives you a better pool to promote from within. They’ll already know the people and the ropes, and they’ll be more loyal if they see you helping people further their careers. Sales compensation is always complicated, and often varies by company. Most comp plans are pegged to results: if a sales rep can make X happen, they’re paid accordingly. But this isn’t the best way to think about it, Otvos says. You always want to compensate your reps based on what they can actually control. It’s impossible for reps to truly control sales or revenue for a quarter. They could have worked 100 hour weeks and still had deals fall through — that’s deflating and doesn’t promote a culture of fairness. Instead of focusing on quota, early sales teams are more likely to succeed by collecting and analyzing activity data that will show who’s a quality sales rep. Percent of quota is virtually meaningless at the earliest stages. Focus on metrics like close ratio. How many deals on a rep’s plate resulted in a close? Now look at how this number stacks up against their rate and frequency of engagement with prospects. If someone has a lot of good engagement with prospective customers but they have a low close ratio, that doesn’t mean they’re a bad rep. It means they need help. 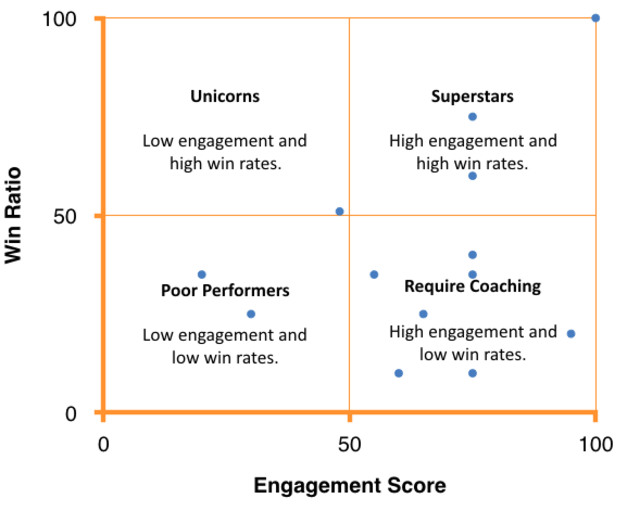 When he investigated who fell into this last quadrant, it was clear they were the reps who just needed more training, either on their approach or the product. As a result, Datahug actually invests in the people who end up in this category — it devotes the training and resources they need to close the gap between interacting with prospects and getting them to sign deals. All of these people have caught up and migrated into the ‘superstar’ quadrant within two or three months. The best sales ops leader is the one who isn't afraid to draw different conclusions than the rest of the executive team. "When you're moving at startup speed, it takes someone pretty courageous to slice your data different ways," Smith says. Instead of telling them to buck up and deal with it, Otvos sat down with individual members of the team and asked them, “Tell me what you’re going to do today.” When they filled him in, he saw that they were all devoting hours out of the day to researching prospects, tracking down contacts, entering them into Salesforce, etc. — and largely for inbound leads too. Hardly any time and attention was going to cultivating outbound leads. At App Annie, one of the key things Otvos did was pay one dedicated junior hire $15 an hour to sit in the corner, search LinkedIn, and enter leads and research into Salesforce. In doing so, he took these tasks off the table for a dozen sales reps who were able to be much more productive with that time. Once Datahug hired the point person they needed for the administrative tasks around sales, all of the reps were able to nail down that one meeting a day. And they did it without feeling stressed out or stretched too thin. Now when Datahug sales reps go into work, they’ll fire up Salesforce and see a list of leads already curated for them for that day. It’s a huge advantage, and a huge contrast to what they were doing — spending an extra half-day chasing down these leads to begin with. When Otvos first instituted the rule, he made sure to emphasize all the closed deals that came out of these meetings. This made people even more enthusiastic, when they saw how their extra work was seriously moving the needle. Finding a tool that fosters collaboration is very important (Otvos is a fan of Yammer, as he is a former employee of the company). There needs to be a place for groups and individuals to present and dissect data, enter feedback, discuss metrics, qualitatively express the issues they’re running into or the objections they’re hearing from prospects. Whichever collaboration tool you choose, it should be available to everyone in the entire company to use. In addition to sales and marketing, engineers and product managers should be able to sign in, see what’s happening, and offer their own hypothesis or solution. Whatever tool you use needs to make everyone on your team feel comfortable with speaking up, being vulnerable, and sharing what they know. At App Annie, Otvos and his team used Yammer to share experiences while split between different offices around the world. Everyone ran into similar product questions, and shared their personal experiences until the right answer was established. Having a tool like this in place from the early days is one of the most powerful things you can do for future scale. In addition to collaboration tools, you also want mechanisms that passively automate work for reps. Some tools can schedule emails to send at a certain time so you don’t have to send all your emails manually. Other tools auto-complete common forms. Things like this save a huge amount of time and helps reps avoid context switching — which can be very costly to productivity in sales. Most startups overlook the most valuable tool at their disposal, one that costs no money: the data and analytics from their own users. “At Yammer, we really benefited from having people on the analytics team dedicated to parsing sales data and coming to show our team what was going on with users,” says Otvos. “From a sales ops perspective that’s awesome. They were able to show us the top companies and people signing up for the product — that basically built our list of who we’d be calling the next day.” This requires the investment of a person on the engineering or analytics team, but he says it’s well worth it. He attributes this to the fact that sales compensation is highly variable, and affected by peer achievement. It’s critical not to let competitive attitudes reduce transparency. The biggest problem I will ever have with anyone is when they don't ask for help. No matter how many things you fix, you always need to be hunting for the next thing that’s broken (or inefficient, as the case may be). Datahug leveraged this mindset when it was weighing the value of free trials. Upon closer inspection, they realized that size of customer made a difference. For larger size companies in certain industries, offering a trial was a successful technique. “We ended up making a rule: ‘If a company falls into X size range and is in Y industry, let’s invest in a trial. If not, no trial.’ We saved a ton of time and were able to focus on delivering a better trial experience where it really mattered.” That’s just one example of how fixing one segment of your process can cause problems down the chain. Don’t let yourself get overwhelmed. Just move down the line, fixing one at a time. Chances are when you’re done you’ll need to start over to make things even better. As numbers-oriented as Datahug is, Smith and Otvos argue that sales ops isn’t just about generating and reading reports. It strikes much deeper to the heart of company culture.